THPBlog: Sierra Pacific Industries to clearcut right next to Union Valley Reservoir in El Dorado County. Sierra Pacific Industries to clearcut right next to Union Valley Reservoir in El Dorado County. This THP is about 13 miles NE of Pollock Pines, CA at Union Valley Reservoir at an elevation of 4870 to 7000 feet. 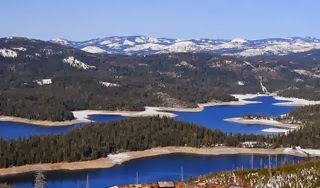 Union Valley Reservoir is a popular camping, fishing and boating reservoir that flows into the South Fork of the American River with 9 campgrounds and hiking trails. This THP will clearcut and log within 300 feet of several of the campgrounds (Unit 141 is adjacent to a SMUD Campground, and unit 124 is adjacent to Wench Campground), and close to a local hiking and biking trail. Sierra Pacific Industries is planning a tractor based logging operation with a significant amount of clearcutting in ponderosa pine, sugar pine, incense cedar, white fir, Douglas fir and lodgepole pine forests. They are proposing to use tractors to pile slash on slopes between 40% and 50%, and on slopes over 30% that do not flatten before reaching a watercourse. They also are requesting an exception to be able to construct and use temporary roads during the winter period. SPI wants to use a landing inside a class I watercourse in unit A, and water bar a road that is diverting erosion across a landing into a class I watercourse. Seven road drainage sites are planned for work including rocking, dip construction and water bar construction. There is an active osprey nest inside clearcut unit 87, and on adjacent USFS land within 400 feet of commercial thinning unit G. Two Northern goshawk territories are located within .5 mi of the THP area in sections 25 and 13, and a bald eagle territory is located .15 mi from the THP area in Section 23. A golden eagle territory is also located within .9 mi of the THP area in section 36. Six CA spotted owl territories are located within .05 to 1.2 mi from the THP area. Section 7 is adjacent to the Pyramid Roadless Area. More information is available on the THP Tracking Center website.